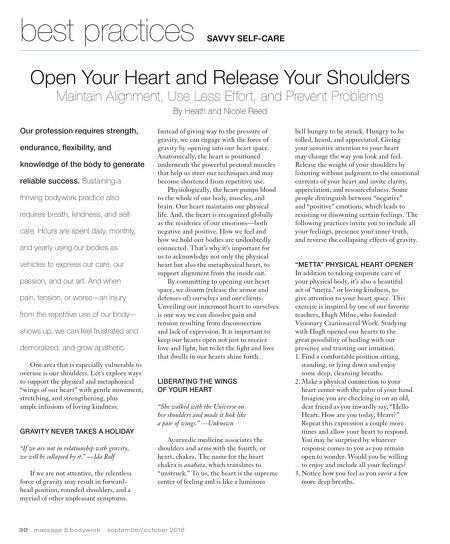 30 m a s s a g e & b o d y w o r k s e p t e m b e r / o c t o b e r 2 0 1 8 SAVVY SELF-CARE best practices Open Your Heart and Release Your Shoulders Maintain Alignment, Use Less Effort, and Prevent Problems By Heath and Nicole Reed Our profession requires strength, endurance, flexibility, and knowledge of the body to generate reliable success. Sustaining a thriving bodywork practice also requires breath, kindness, and self- care. Hours are spent daily, monthly, and yearly using our bodies as vehicles to express our care, our passion, and our art. And when pain, tension, or worse—an injury from the repetitive use of our body— shows up, we can feel frustrated and demoralized, and grow apathetic. One area that is especially vulnerable to overuse is our shoulders. Let's explore ways to support the physical and metaphorical "wings of our heart" with gentle movement, stretching, and strengthening, plus ample infusions of loving kindness. GRAVITY NEVER TAKES A HOLIDAY "If we are not in relationship with gravity, we will be collapsed by it." —Ida Rolf If we are not attentive, the relentless force of gravity may result in forward- head position, rounded shoulders, and a myriad of other unpleasant symptoms. Instead of giving way to the pressure of gravity, we can engage with the force of gravity by opening into our heart space. 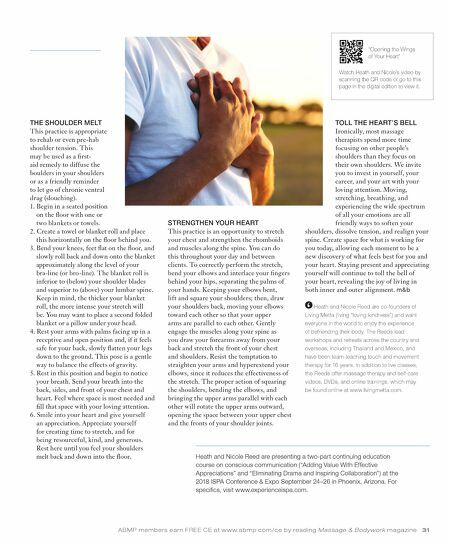 Anatomically, the heart is positioned underneath the powerful pectoral muscles that help us steer our techniques and may become shortened from repetitive use. Physiologically, the heart pumps blood to the whole of our body, muscles, and brain. Our heart maintains our physical life. And, the heart is recognized globally as the residence of our emotions—both negative and positive. How we feel and how we hold our bodies are undoubtedly connected. That's why it's important for us to acknowledge not only the physical heart but also the metaphysical heart, to support alignment from the inside out. By committing to opening our heart space, we disarm (release the armor and defenses of ) ourselves and our clients. Unveiling our innermost heart to ourselves is one way we can dissolve pain and tension resulting from disconnection and lack of expression. It is important to keep our hearts open not just to receive love and light, but to let the light and love that dwells in our hearts shine forth. LIBERATING THE WINGS OF YOUR HEART "She walked with the Universe on her shoulders and made it look like a pair of wings." —Unknown Ayurvedic medicine associates the shoulders and arms with the fourth, or heart, chakra. The name for the heart chakra is anahata, which translates to "unstruck." To us, the heart is the supreme center of feeling and is like a luminous bell hungry to be struck. Hungry to be tolled, heard, and appreciated. Giving your sensitive attention to your heart may change the way you look and feel. Release the weight of your shoulders by listening without judgment to the emotional currents of your heart and invite clarity, appreciation, and resourcefulness. Some people distinguish between "negative" and "positive" emotions, which leads to resisting or disowning certain feelings. The following practices invite you to include all your feelings, presence your inner truth, and reverse the collapsing effects of gravity. "METTA" PHYSICAL HEART OPENER In addition to taking exquisite care of your physical body, it's also a beautiful act of "metta," or loving kindness, to give attention to your heart space. This exercise is inspired by one of our favorite teachers, Hugh Milne, who founded Visionary Craniosacral Work. Studying with Hugh opened our hearts to the great possibility of healing with our presence and trusting our intuition. 1. Find a comfortable position sitting, standing, or lying down and enjoy some deep, cleansing breaths. 2. Make a physical connection to your heart center with the palm of your hand. Imagine you are checking in on an old, dear friend as you inwardly say, "Hello Heart. How are you today, Heart?" Repeat this expression a couple more times and allow your heart to respond. You may be surprised by whatever response comes to you as you remain open to wonder. Would you be willing to enjoy and include all your feelings? 3. Notice how you feel as you savor a few more deep breaths.